Jammu, November 05 (Scoop News)-The Darbar Move offices opened here today after their annual move from Srinagar on October 26. Civil Secretariat and other offices opened here today after a transit period of nine days. Governor, Satya Paul Malik arrived at Civil Secretariat where he was warmly received by the Advisors, B B Vyas, K Vijay Kumar, Khurshid Ahmed Ganai, Chief Secretary B V R Subrahmanyam, Director General of Police, Dilbag Singh, Administrative Secretaries, representatives of various employees’ unions and a large number of officers and employees of Civil Secretariat. 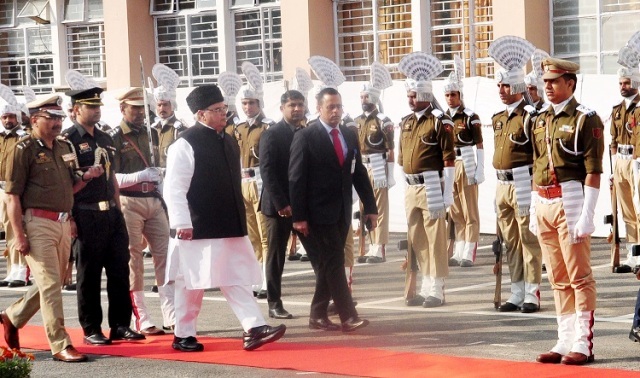 The Governor inspected the ceremonial guard of honour by a contingent of J&K Police and interacted with Advisors, officers and employees and enquired about their well being. Later, addressing a press conference, the Governor reiterated the resolve of government for tirelessly working towards ensuring responsive and good governance at all levels. Referring to situation arisen due to heavy snowfall and rains in Kashmir Valley and parts of Jammu region, he said the administration’s response was prompt in the restoration of services in the affected areas. He said the farmers suffered losses for which government has provided them interim relief, while adding that further assessment is being carried out for providing compensation to the victims of the natural calamity. He informed that the assessment of losses will be completed within 2-3 days. The Governor said that power supply to majority of areas of Kashmir valley has been restored as 90% of restoration work has been completed.